From the wooded trails of Sherwood Forest comes Robin Hood: Shifting Riches. 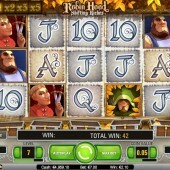 This Net Ent slot game sees Robin and his merry men round up treasure from the wealthy to give to the poor. Anyone that has seen the Kevin Costner film - Robin Hood Prince of Thieves - or the more recent effort starring Russell Crowe will get the idea. There's a nice feature here which occurs every time you hit a winning line. All the reels move down one place and the final reel drops off with a new one appearing by the Reel 1. This then spins to reveal 3 new symbols and potentially create new winning lines. What also occurs is the multiplier increases each time (capped at 5x), so the more winning lines you get in a row the bigger your reward. There is also a free spins bonus round, but it can take a while to hit. You need to get four money bag symbols on the same reel. This can take a while to accumulate, but the good thing is that it can be done over multiple playing sessions. You are awarded 10 free spins with an extra wild symbol, which can be rewarding on occasion. 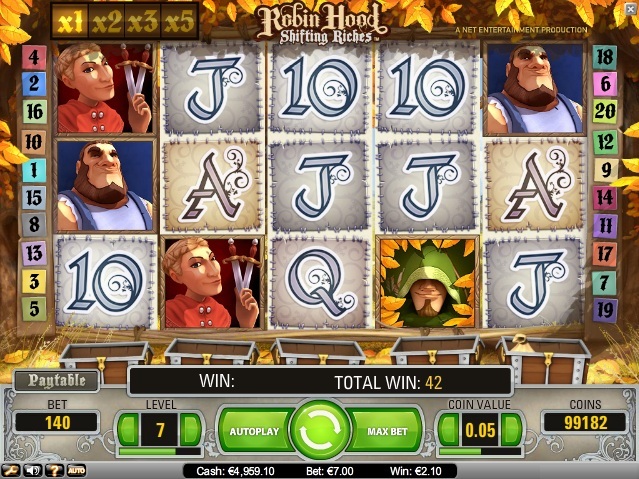 If you like Robin Hood, then you might also want to check out the Jack Hammer slot, which also comes with a few unique features of its own. It is hard to beat Net Ent’s Gonzo’s Quest though for gaming entertainment, though, which comes with tumbling reels and increasing multipliers. Have a look at our review and enjoy some free-play to see for yourself.